David slew Goliath with a stone from his sling and then beheaded Goliath with a sword. The story of David and Goliath is one of the most famous stories of the Bible, and reveals much about David's faith and courage. When the Philistine arises, David charges to meet him, grabs his slingshot and launches one stone that hits the Goliath's forehead, who then falls upon his face to the earth. David next uses Goliath's sword to cut off his head, at which point the Philistines flee, with Israel soon in pursuit. David saves both Goliath's head and his armor. 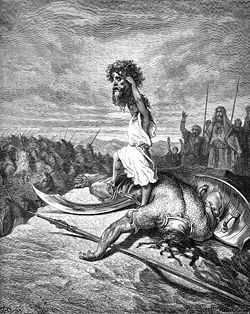 (1Sa 17:48-54) That the text (vs. 50,51) says that David “slew” (KJV) the Philistine with the stone, while the next verse attributes the means of death to David cutting off his head, may refer to Goliath being as good as dead from the stone in lieu of what would happen next. (cf. Gn. 20:3) Saul then inquires as to whose son this hero was, and which seems odd considering that David had been chosen to serve him previously, (1Sam. 16:23), but which many commentators see as due to Saul's troubled mind. Says Henry, “Saul had forgotten him, being melancholy and mindless, and little thinking that his musician would have spirit enough to be his champion; and therefore, as if he had never seen him before, he asked whose son he was. Abner was a stranger to him, but brought him to Saul (1Sam. 17:57), and he gave a modest account of himself, 1Sam. 7:58. And now he was introduced to the court with much greater advantages than before, in which he owned God's hand performing all things for him.” Other objections to the text are also made and dealt with. ↑ Keil & Delitzsch, ibid. This page was last modified on 26 May 2017, at 00:19.